After a number of months searching the classifieds I’ve finally taken the plunge. 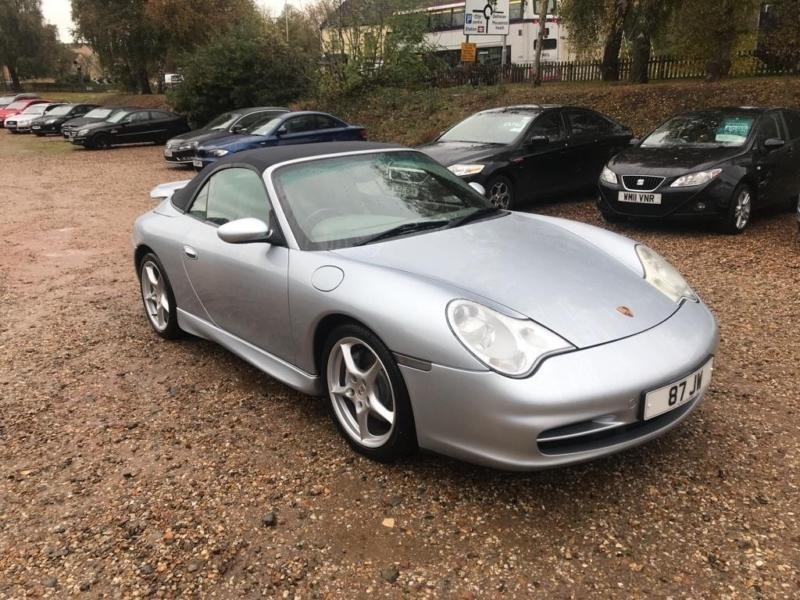 I have a 2002 996 cabriolet C4s in blue/silver with grey leather, 54000 miles, I’m missing the handbook so it’s good fun hitting google to find out what does what which is how I found this site. I’ve booked in to have a new headliner and hood fitted as this is showing it’s age, I have also ordered a leather dye kit to reduce the door cards as these has water stains which won’t come out. Lots of small tlc items to attend to to get the car where I want it. If people are interested I will keep this thread updated with the progress. Hi congrats. Smart car. It's not a C4S though. More like C4 with the Tiptronic S box which some people wrongly call a C4S. As long as you didn't pay C4S money for it. Enjoy though. Nothing like that feeling of achieving your first 911. Colour is Polar Silver. Nicer than Arctic Silver. Looks great with a blue roof. That's what I'd go for. Congratulations on your purchase, and to Porsche ownership, and welcome to 911uk. I think folk around here will be disappointed if you don't keep your thread updated with your intended progress. The owners manual is about £25 from Porsche. I had to buy one. I found a USA version on line and have it in iBooks. I can send you a copy or a link to down load. Send me a PM if you want it. Best of luck with it - there is plenty of help and knowledge here. This place is the number one information resource for a 996. Polar Silver cab with blue roof oh yes!! Many thanks for the kind replies will definitely keep you all updated. Based in Norwich, any meets this way ? Welcome Nipper, I saw Polar next to Arctic the other day, Polar is way superior! There’s a TIPEC group in Peterborough, not that close. Google TIPEC and PCGB to find local meets. I fondly remember being where you are now - 'can't believe it's been 9 years. You do realise there's no going back. Bought my first one 30 years ago almost to the day. Still going strong. Yopurs is lovely. Ps - number plate plinth removal job no 1. Let me know when u get to a 1000 mods and you can celebrate with me!